Jordan Stanger-Ross, “Telling a Difficult Past” Kishizo Kimura’s Memoir of Entanglement in Racist Policy” BC Studies no.181, Spring 2014. 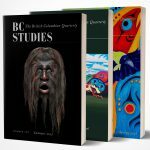 Nancy Turner, Dana Lepofsky and Doug Deur, “Plant Management Systems of British Columbia’s First Peoples,” BC Studies 179 (Autumn, 2013), 107-133. Richard Rajala, “`Streams Being Ruined from a Salmon Producing Standpoint:’ Clearcutting, Fish Habitat, and Forest Regulation in British Columbia, 1900-45,” BC Studies 176 (Winter 2012-2013), 93-132. Lynne Davis, “Home or Global Treasure? Understanding Relationships between the Heiltsuk Nation and Environmentalists,” BC Studies 171 (Autumn 2011), 9-36. Cameron (previously Karen) Duder, “Public Acts and Private Languages: Bisexuality and the Multiple Discourses of Constance Grey Swartz,” BC Studies136 (Winter 2002-3), 3-24.